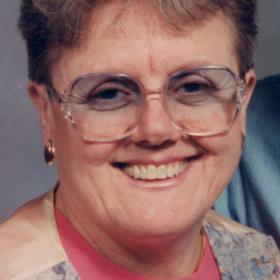 Mrs Joan Frances Krueger, age 82, passed away surrounded by her familly at the Poppen House on Wednesday, January 16, 2019. She was born in Detroit MI on December 29, 1936 to William & Frances (Tomalla) Monticello and married Donald Krueger in 1973. Mrs Krueger had been employed as a Custodian and Teachers Aide for Grand Haven Public Schools and operated Happy Tails Pet Grooming. Joan was a member of St. John’s Lutheran Church of Grand Haven and enjoyed volunteering at Noah Project. She is survived by Daughters, Mary (Steve) Kindred of FL, Janet (Randy) Priest of Muskegon; sons, Grant Danskine of FL, Andrew (Tracie VanderStelt) Danskine of Peacock MI; stepchildren, Kathy Wirth-Krueger of Grand Haven, Tammy (Ted) Sibley of Grand Haven, Sherry (John) Miller of Allendale; 15 grandchildren; several great grandchildren; She was preceded in death by her husband Don in 1995 and her parents. Tuesday, January 22, 2019, 11:00 AM with visitation one hour prior to the service at the Clock Chapel - Muskegon with Pastor Kurt Wenzelburger officiating. MEMORIAL: In lieu of flowers, please consider giving to Noah Project or Harbor Hospice Foundation.